Hilary (left) and Emily Ziraldo (right) of varsity blues field hockey. 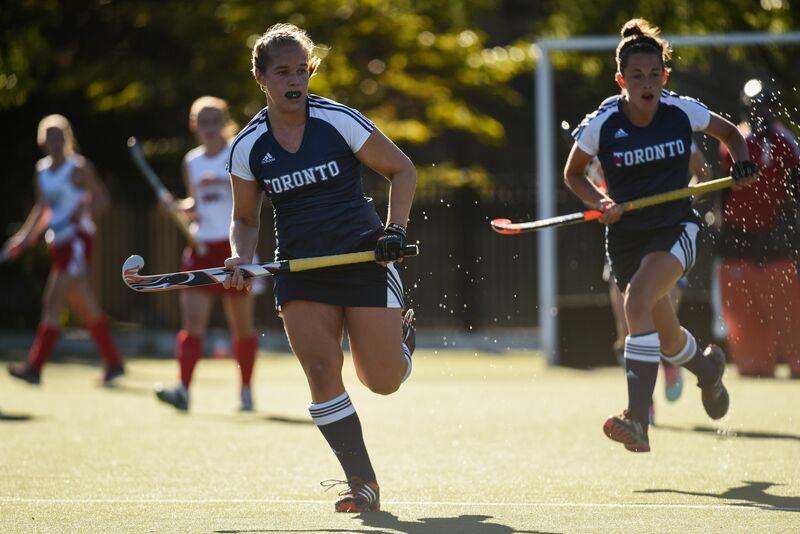 It’s impossible to look at the University of Toronto’s field hockey roster without noticing two identical faces. Hilary and Emily Ziraldo look to be one and the same: blond hair, blue eyes, same facial features. The only difference? Their year of eligibility and field hockey positions, as they tend to each play on opposite sides of the field as outside midfielders or defenders. Both going into their third year of university, 2016 was the first time the Ziraldo twins played together as Varsity Blues, with injury splitting them up in their first varsity season and setting Emily back a season of play. Having stress fractured her foot in her final year of high school, Emily’s injury still had not healed by the time her first season began and she was forced to sit that year out. Even so, that season proved to be a bonding moment for the twins, as Hilary found the support system of her sister on the sidelines beneficial while experiencing both her first year of university and the realities of her rookie season in a team of veteran players. That season was a pretty tough transition, just to university in general and then we had a pretty old team that year. I was pretty fortunate I guess to get a lot of playing time. I did pretty well that year, as a player, and I think having my sister there really helped. It was really hard that she wasn’t able to play as well…Just knowing that she was there and I wasn’t alone really was nice. That connection may be of even more importance today, knowing that two years ago it was a possibility that the pair would attend different schools. As explained by Emily, her post-secondary choice was more up in the air than her sister’s. 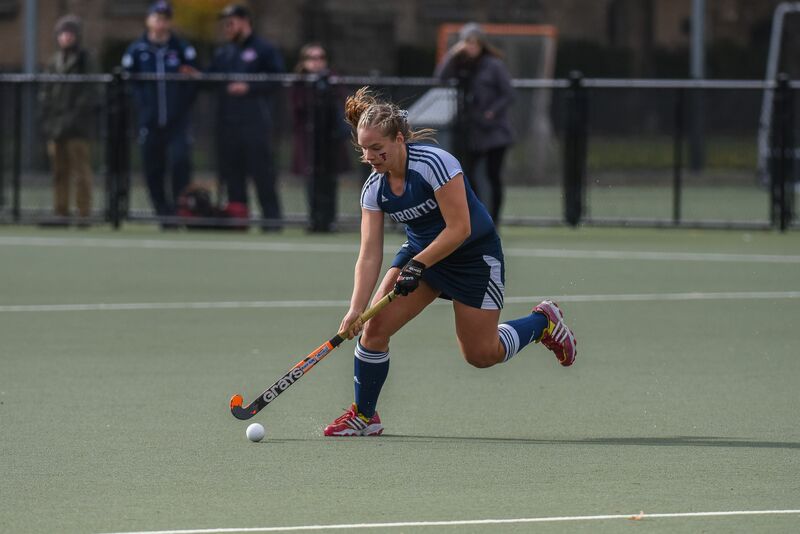 The deciding factor in Emily keeping the twins together for university, she explains, was the coaching staff and facilities available at the University of Toronto. In particular, U of T is home to one of the only water-based fields – the type used at the international level – at an Ontario university. The venue was built to host the field hockey competition for the Toronto 2015 Pan American Games. On the coaching side, the Varsity Blues were previously led by former national team player and coach John DeSouza. This past summer, the program announced the appointment of Cassius Mendonça as head coach. 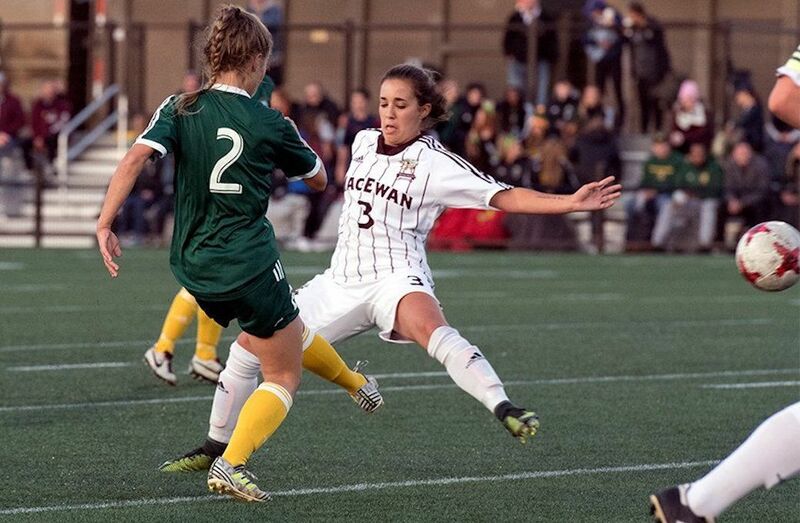 Mendonça served as the Varsity Blues assistant coach for the past eight seasons, winning a U SPORTS championship in 2010, to go along with five OUA titles, including last season’s third consecutive conference banner that featured both Emily and Hilary in the lineup. He recently worked with the Canadian women’s national indoor teams as assistant coach. Currently, he is the head coach of A&C Field Hockey Academy. There is also a certain familial connection to U of T, though neither twin suggests it was a factor in their decision to join the Varsity Blues program: their mother was a member of the Varsity Blues swim team, competing at a high level in her time at the school. Emily explains that neither her, nor her sister felt a deep connection or pride for the varsity program until they became a part of it themselves. Now that I’ve come to U of T...you feel the sense of pride that all the varsity athletes have at being part of the Varsity Blues and being part of such a great program. Once I’m here, I really feel (that pride). But growing up, not so much. So, what exactly is the benefit of that sisterly connection? Though maybe not going as far as explaining it as twin telepathy, the Ziraldo sisters benefit from years of training side-by-side and learning the sport together: both have played field hockey since the age of 16, receiving much of the same coaching for the last four years. “I think it’s just a movement, the way (we) see the game is really similar because we’ve trained together so much that all those different coaching influences have really made it easy for us to see the game in the same way,” Hilary explains.